Arizona Highways has been covering the scenic wonders of the state since 1925, so it stands to reason that Arizona’s version of “the long and winding road” would have found its way into the magazine on many occasions. That said, it’s always worth another look, and no book of scenic drives would be complete without this one. Like the Beatles’ swan song, this road trip is a classic. 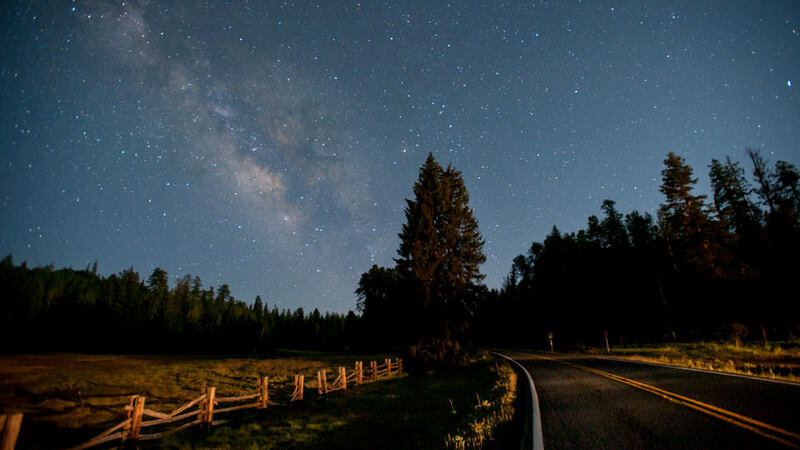 Now designated a National Scenic Byway, the Coronado Trail winds for more than a hundred miles from the twin cities of Eagar and Springerville in the north to the twin cities of Clifton and Morenci in the south. In between, the four-hour route follows the trail used in 1540 by Spanish explorer Francisco Vasquez de Coronado as he searched for the fabled “Seven Cities of Cibola.” He wasn’t joy-riding in an Escalade, but he surely marveled at the views, which begin among the rolling grasslands on the outskirts of Eagar. From there, the southbound route climbs past the Sipe White Mountain Wildlife Area — look for elk, ospreys and golden eagles — into the spruce-fir forests near Alpine, a Swiss-like village settled in the late 1870s. Along the way you’re going to confront the harsh realities of what happens when Leave No Trace ethics are ignored. The Wallow Fire, which was started in 2011 by two careless campers from Tucson, torched more than 550,000 acres of gorgeous forest, including most of Escudilla Mountain (Aldo Leopold is surely rolling in his grave). Some of the worst evidence of the fire can be seen from the road just before Alpine. Despite the carnage, the overall drive is still remarkable, and even the burn areas are coming back to life as a result of the lush grasses and young aspens that are moving in. Nevertheless, please use your ash tray. Not just on this drive, but everywhere. Just south of Alpine, which is the last stop for fuel, you’ll come to Hannagan Meadow. Named for Robert Hannagan, a Nevada miner who did some cattle-ranching in the area, the meadow would have certainly inspired a Frost poem, had he ever walked by. In 1926, Arizona Governor George W.P. Hunt was in the area to celebrate the opening of the Springerville-to-Clifton highway, which was called Route 666 back then, and has since been changed to U.S. Route 191. Because of the dedication, the forest service issued a permit for a store to be built, and later a service station, cabins and a restaurant. After that, the main lodge was built to accommodate travelers who made the two-day trek either up or down the Coronado Trail. Today, Hannagan Meadow Lodge, which has undergone numerous upgrades since 1926, is still the only place to stay, and it’s still in the middle of nowhere. Of course, the remote address is the main attraction, but the lodge itself is nice, too. Surrounding the lodge is the Blue Range Primitive Area, which offers some of the most incredible scenery in the state. Among the highlights are three beautiful rivers — the Black, the Blue and the San Francisco. As you head south, keep your eyes peeled. Within a stone’s throw of the road are more than 100 species of fish and wildlife, including elk, mule deer, antelope, black bears, squirrels, bald eagles and 160 other kinds of birds. The fishing is great, and the stands of aspens, oaks, maples, mountain ash, firs, spruce and junipers will make wherever you came from seem like a million miles away. Like many roads in Arizona, the Coronado Trail is a four-season wonderland. Fall colors are incredible. Spring wildflowers are spectacular. Winter snows make the area the state’s cross-country skiing mecca. And in summer, the cool temperatures speak for themselves. The next stop is the Blue Vista rest stop at the edge of the Mogollon Rim, which, on a clear day, allows you to see as far as the eye can see. From there, the road works its way south to Clifton and Morenci, and tests your nerve with some hair-raising curves. Although the twin cities at the end of the road aren’t as scenic as their sisters in the north — open-pit mining has a way of doing that — they do have an important history, along with some of the nicest people you’ll ever meet. The towns have gas stations, too, which will come in handy if you decide to turn around. And you probably will. As you’ll see, the long and winding road is always worth another look. Directions: From Payson, go east on State Route 260 for 87 miles to U.S. Route 60. Turn left onto U.S. 60 and continue 49 miles to Springerville. From Springerville, go south on U.S. Route 191 for 120 miles to Clifton. Vehicle requirements: None, but there are several sharp curves and steep drop-offs along this narrow road — in some cases, there are no guardrails, and in some areas, speeds may slow to 10 mph. Travelers in Arizona can visit www.az511.gov or dial 511 to get information on road closures, construction, delays, weather and more.